It aims to engage students with a mix of online lectures and in-class components. Her class deals with pharmacokinetics, the study of what the body does to a drug, using mathematical descriptions. All 120 pharmacy students at U of Waterloo take this tough course, which turned out to be equally demanding for Dr. Edginton to design, even with the university’s Centre for Teaching Excellence at her side. Once the blended learning class was up and running, her in-class hours did decline. More importantly, the time she spends with her students is rewarding and fun, and her understanding of what makes good class design has been revolutionized. Best of all, Dr. Edginton found that blended learning, with interaction at its core, enriched her students’ learning. “It was transformative for all of us,” she says. Dr. Edginton’s experience highlights the promise and challenges that accompany the growth of blended learning across Canada. These new and revamped courses vary in style and substance, but generally they call for individual and shared study to take place online, with reduced class time that focuses on lively group activities rather than lectures. Students work at their own pace, accessing the online materials when and where they want, then bring problems and discussion to a lab or tutorial. In large first-year blended courses, a professor and assistants often team-teach, the professor taping a series of videos and the assistants handling lab time. An introductory blended-learning geography course at McMaster University, for instance, asks students to view the lecture video as many times as they want at home. Then, in class they rotate through a set of stations for hands-on learning about maps and other geographic tools. As she prepares to teach her course for the seventh time, Dr. Edginton wants to emphasize the “thoughtful” part: She spent three months experimenting with course components in her basement and has already swapped one video-creation program (Camtasia) for another (Adobe Presenter), as well as tweaking her course based on student feedback. Individual efforts like hers are typical of how blended learning has developed, in pockets, over the past decade. Now, official support is underwriting new and reworked courses across faculties, at undergraduate and graduate levels from Memorial University to the University of Victoria. Potential savings at first warmed senior administrators to the idea of blended learning. However, cost benefits may prove elusive: it’s expensive to develop online components, hire technical staff and support keen instructors. Still, many universities are committing to explore blended learning to meet student demands and pedagogical goals in a competitive arena and to improve student learning outcomes. University of Ottawa’s president, Allan Rock, agrees that blended learning likely won’t reduce costs or increase revenue, but he says, “It’s high time for us to move quickly in this area.” U of Ottawa will spend $300,000 over the next few years on technical support alone, he adds. This year, 25 blended courses are being developed. Forty are already running. By 2020, the university wants at least 20 per cent of its courses to be blended, with one-third of all professors involved. 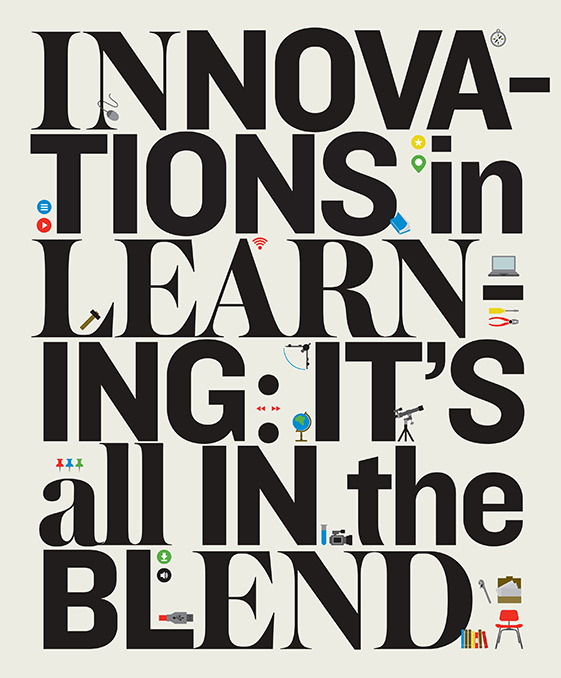 So what is the appeal of blended learning? Researchers, professors, students and administrators interviewed for this story say that, above all, the method offers flexibility. Students can study online on their own time (2 a.m. is popular) and at their own pace. In a face-to-face lecture “you can’t fast-forward or rewind your prof,” says McMaster geography student Kaitlin Hendershott. Students come to campus less often and when they do, the professor-student interaction is richer, the learning deeper. When students have more control over their schedules, their satisfaction with the course increases, according to early findings in COHERE’s report on blended learning. COHERE is a 15-year-old collaborative that involves a handful of Canadian universities focused on the research and practice of blended and online learning in higher ed. All of the learning components, from blogs to video conferencing to discussion forums, combine to help students not just memorize facts but also think critically. Good design and execution build what researchers call engaged communities of inquiry, where learning is a cooperative activity. Blended learning is especially helpful for those who have non-traditional learning styles or have trouble keeping up; students who don’t speak in class may contribute more online, for example. “It builds the confidence of second-language learners,” says Maurice Taylor, a professor in U of Ottawa’s education faculty. In Dr. Edginton’s class at U of Waterloo, blended learning flipped a communal switch. She realized the students were not, in fact, unmotivated and disengaged. Rather, many were struggling in silence to understand the lectures, and as a result they turned off. Now, her course presents the facts of pharmacokinetics in compelling slides and videos, along with clear instructions for activities (like self-assessment quizzes) and problem sets for the students to try on their own, then bring to the bi-weekly tutorial. (Students can follow Dr. Edginton’s own cursor as it guides them through the material.) Her newly published research shows that students’ enthusiasm grew as the course progressed, and their worries about not seeing her enough dissipated. In another blended course she teaches, students’ grades were much higher than in the previous lecture course; it’s due, she thinks, to thoughtful – if time-consuming – course design. The time the students spent together working out problems, with or without their instructor, was crucial to their understanding and application of concepts in Pharm 224. Andrew Hamilton took the course last year and “absolutely loved it.” For that, he credits the layout of the online portion (clear instructions, do-it-yourself quizzes, high production values in the lecture video, an accompanying transcript) and the animated way Dr. Edginton answered questions in tutorials. Even when he didn’t need to, he attended her weekly “mighty minutes” of review to solidify his understanding and help others. Not even cool videos and animation will engage everyone. Like Dr. Edginton, others in the academy are trying to measure blended learning’s actual effectiveness. At Mount Royal University, researchers found that online interaction and assessment contributed to better grades, according to the COHERE report on blended learning. In 2014, the Higher Education Quality Council of Ontario also assessed a blending learning model, in this case a model used in three first-year social science courses at McMaster University. The study found that eight out of 10 students surveyed in the blended courses reported using online modules repeatedly, to improve their understanding of the content rather than just to get a better grade. That said, “it was great to be able to review more than just my notes when it came time to study for exams,” says Ashleigh Patterson, who took a blended geography course at McMaster. Online and blended learning breed efficiency, too. Professors attending mid-term conferences don’t worry as much about cancelling class because students can watch lectures and work online while they’re away. Once a course has been developed, professors spend less time on teaching and more on research. It’s easy to analyze data collected from online elements to see who needs help. Administrators who think they need more classroom space might realize that they don’t, since blended learning frees up rooms. Students save money with fewer trips to campus. They view lectures when they learn best, not at 8:30 a.m., when they may be half-asleep. In fact, students’ lifestyles, including night-owl habits, are catalysts for changing how universities function. For better or worse, students live in a technological world and expect high production values, whether gaming or learning. But that doesn’t mean they are the techno-whizzes that some teachers assume. In the HEQCO study, many McMaster students said that they felt “uncomfortable” using library databases and advanced search engine features until they’d experienced blended learning. Assessments show that students need guidance online and find no substitute for a passionate, knowledgeable instructor. This leads to the “commitment advantage.” Professors are usually devoted to their disciplines, and that motivates them to re-engage with content through course redesign. Once they see the advantages, the prep time and angst become memories, say those who’ve been won over. Money also motivates. Dr. Flynn at U of Ottawa got $5,000 to hire teaching assistants and develop videos. Dr. Edginton at U of Waterloo received $14,000. Blended learning might also inspire journal articles for young scholars. Did Dr. Edginton’s practice of, and papers about, her experiment help her to get tenure? “It didn’t hurt,” she says. To be sure, many factors cloud the blended learning scene, particularly when skeptical professors do cost-benefit analyses. Blowing up long-taught courses and starting over with unfamiliar technology is not everyone’s choice, especially with competing demands. Instructors interviewed for this article said they needed three months to more than a year to create a course. Blended learning doesn’t work well for a course whose material needs constant updating, since every online component would have to be revised continually. The money available is often inadequate: U of Ottawa offered grants last year for course development, but only enough for 11 professors. One teacher worries about intellectual property: if he creates a course, who owns it? Could a university take it over, hire a TA to teach it, and lay him off? Professors who do take up the challenge can feel like they are drowning in vast oceans of infinite possibilities, says Dr. Flynn. What kind of text, audio or visuals, wikis and blogs, and in what combination? What face-to-face activities support the e-learning? How will assessment work? How does an introductory course for 300 differ from a graduate tutorial? Will what works at Mount Royal University apply to the University of Toronto? Then there are the thousands of sessional instructors who carry much of the teaching load. While some of these contract workers want to show their potential or like to experiment with technology, not many would vote in favour of transforming courses for free. Even students may put on the brakes. Many fear moving from sitting passively in lectures to taking a more active role in their learning. So far, research on the efficacy of blended learning has tried mainly to measure grades; the student-experience research is international and results are mixed. In Canada, there isn’t enough national data, partly because education is a provincial matter, and that’s frustrating, says Norman Vaughan, a Mount Royal education professor who co-wrote the guidebook on the topic. Longitudinal research, especially, is lacking, adds John Maclachlan, a geography professor at McMaster who co-wrote the HEQCO study. Also, the metrics to analyze blended learning’s effects beyond test scores have not been developed. Would studies show, for instance, whether students do better in other courses once they’ve developed cognitive skills through blended learning? Ultimately, whether Canadian universities fully explore the possibilities of blended learning depends on how much long-term research, funding and technical support are committed to it. While start-up money for blended learning is plentiful, says Dr. Maclachlan, there hasn’t been one bit of maintenance money yet. Vivian Smith is a newspaper and magazine journalist based in Victoria. Her book Outsiders Still: Why Women Journalists Love – and Leave – their Newspaper Careers will be published by University of Toronto Press this coming spring.